Near a 4-Year Low, Is InvenSense Inc a Buy? If the company can do these two things, it's a buy. Otherwise, we're looking at a value trap. The Internet of Things (IoT) -- a world where all of our electronic devices can communicate with one another -- was supposed to be the Next Big Thing. In a way, it is -- but the results for investors who hopped on the IoT train have been nothing short of disappointing. Consider what's happened to InvenSense (NYSE:INVN) since mid-2014. InvenSense is actually near an all-time low since going public in 2011. Below, we'll evaluate why the company has fallen, what its prospects look like going forward, and what kind of deal we'd be getting on shares today. 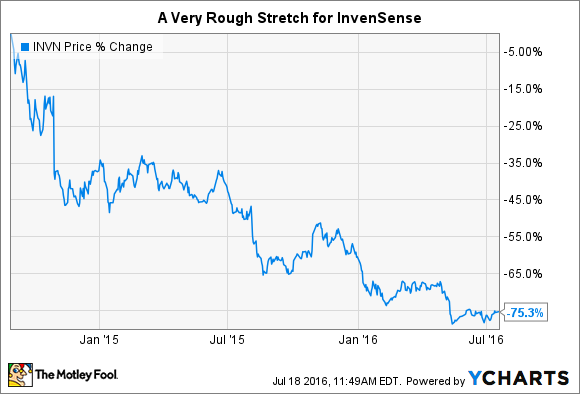 Why has InvenSense so fallen out of favor? Here's the short answer for why InvenSense hasn't panned out as an investment: (1) it relies far too much on a few customers for its business, and (2) it has yet to really become an IoT company. Instead, its motion sensor technology remains the dominant source of income. During the company's last fiscal year, Apple (Nasdaq: AAPL) accounted for 40% of net revenue, while Samsung (Nasdaqoth: SSNLF) chipped in 16%. That's bad for two reasons. First, if someone at either of these companies decided to pick a different provider of motion-sensor chips, it would spell doom for InvenSense. While InvenSense has the advantage of deep relationships with both companies, if the technology the company provides is commoditized, Apple or Samsung will choose the cheaper, good-enough provider in a heartbeat. Furthermore, even if InvenSense remains in good graces with these two, a weak smartphone market—particularly in the high-end market—would asymmetrically affect InvenSense. Currently, the company's fate is largely tied to trends in the smartphone market. InvenSense is trying to do something about that—particularly by looking for opportunities in the Internet of Things. Management qualifies all things IoT related as part of the company's "IoT & Other" division. As you can see, it still makes up a small part of the revenue pie. Of course the growth of IoT over the past year—clocking in at 115%—is very encouraging. Management said this was due to,"increased adoption and expansion of a range of consumer electronic products in...the IoT market ." But the fact of the matter is that it still accounts for just 20% of all revenue. And that needs to change to make this a more compelling investment. What does the future look like for InvenSense? Over the medium-term, the company will still be heavily influenced by smartphone and tablet sales. There's simply no way around that. If Apple's next gen phone—likely tabbed the iPhone 7—is a success, it would be an important win for InvenSense. But even then, it will be crucial for investors to watch gross margins. Apple is (in)famous for squeezing suppliers for all they are worth, and InvenSense is no exception. In fiscal 2014 , gross margins stood at 49.4%. But over the last twelve months, they have shrunk to 41.6%. While management sees margins improving to the mid-40% range, such action should give investors pause that InvenSense's technology is becoming commoditized. Over the long-run, the continued move into IoT is paramount. While no single opportunity in IoT will be as large as InvenSense's tie-ups with Apple and Samsung, if the company can use its FireFly platform diversify its base of customers, it would make the company far less sensitive to the smartphone market. Management sees possibilities in a number of industries—including drones, virtual reality, augmented reality, automotive, wearables and other applications—but success in any of those is far from a guarantee. Is it worth it at these prices? Technically, InvenSense is running in the red right now. But if we back out some one-time payments and stock-based compensation, the company made $0.50 per share. It also brought in $75 million in free cash flow (FCF). Given this, it trades for a fairly reasonable 13 times earnings and 8 times FCF. But that's not the whole story. The company is only expected to earn (non-GAAP) $0.12 per share in the coming year, and that equates to a much higher forward P/E of 53. While there's no doubt that InvenSense's stock is cheap right now, I would caution to say that it's a buy. The company's path to success—keeping margins stable and growing while expanding IoT offerings—is pretty clearly defined, the risk of commoditization and losing out to well-heeled rivals is huge, and there's not much that gives me confidence that InvenSense will be a clear winner. I think investors would be better off finding other places for their hard-earned cash.